We go shooting with Nikon's ultra zoom, the Nikon Coolpix P1000, with 125x optical zoom lens, it offers the most optical zoom of any camera. The new Nikon Coolpix P1000, quite literally, reaches for the moon and stars with one of the biggest and most in your face optical zoom we've ever seen! However, this comes with a number of unavoidable issues which includes the size and weight of the camera, needing a tripod for anything over 2000mm and a rather poor battery life. It's been a while since Nikon introduced a new 'ultra-zoom' to its line-up, 3 years to be precise, so the arrival of the Nikon Coolpix P1000 Bridge Camera has got people talking. The new Nikon Coolpix P1000, quite literally, reaches for the stars with a huge zoom lens that's equivalent to 24-3000mm and gives photographers 1000mm more zoom than the Nikon Coolpix P900 with "only" 83x optical zoom lens. 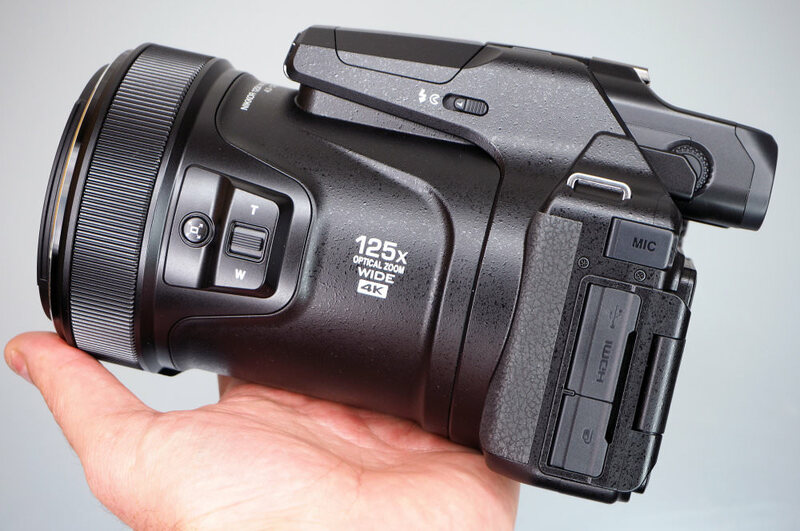 The P1000 has an RRP of £999 and will be available this month (September) but we've managed to get our hands on the 'ultra-zoom' early so we can let you know if the big reach, and other features, are worth almost £1K. The Nikon Coolpix P1000 takes the 'ultra-zoom' bridge camera to a whole new level - with a 125x optical zoom lens (equivalent to 24-3000mm). 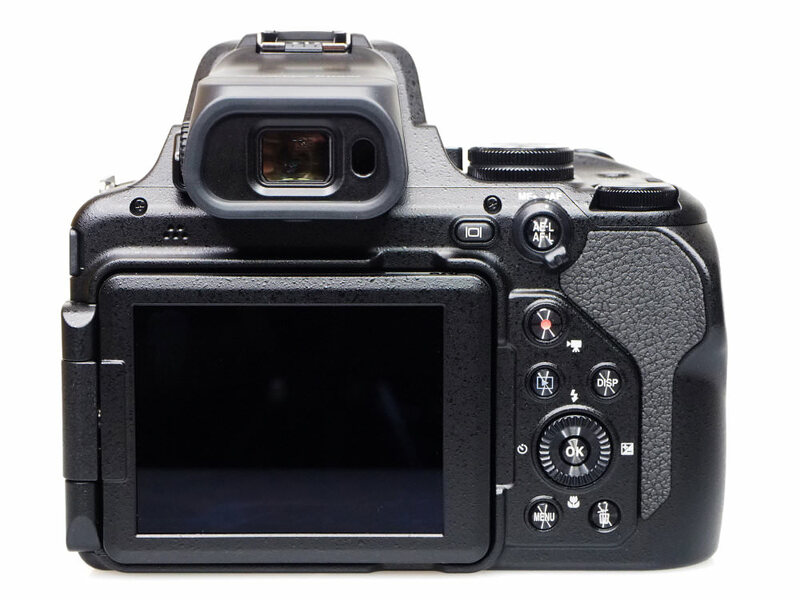 The P1000 features a 3.2inch screen and high-resolution electronic viewfinder (EVF) with 2.36m dots. The Nikon Coolpix P1000 offers a whopping 125x optical zoom, going from 24mm equivalent all the way to 3000mm! To help control the whopping 125x optical zoom, there is side zoom control and a snap-back zoom button. There's even a Moon mode for shooting photographs of, well, the moon. Dual Detect Optical Vibration Reduction (VR) system gives 5 stops of image stabilisation and for more advanced photographers, there is full manual control, a Flash hot-shoe and RAW shooting (something the P900 didn't offer). There's also a focus mode selector that can be used to change the focus mode after focus has been acquired and a control ring that enables the adjustment of settings such as white balance and manual focus. If you want to use external Speedlights, the Coolpix P1000 is equipped with an accessory terminal as well as an accessory shoe and a new Bluetooth remote control will soon become available so you can shoot remotely with the camera. The camera also has Wi-Fi and Bluetooth built-in so it is compatible with the Nikon SnapBridge app which can be used to quickly sync images captured with the P1000 to your smartphone. Nikon says the Coolpix P1000 can take 250 shots on one battery but it does weigh in at 1415g which will give your biceps and forearms a bit of a workout when holding it for a while. As well as a 2359k-dot OLED electronic viewfinder, that offers a magnification of approximately 0.68x, there's a 921K, 3.2inch vari-angle screen but it's not touch-sensitive. The eye sensor does, however, automatically switches from monitor shooting to viewfinder shooting the instant you raise the camera to your face. We've already mentioned that the Coolpix P1000 has a huge zoom but to give you the precise numbers, it starts at the wide-angle end, offering 24mm equivalent and extends to the super-telephoto, 3000mm equivalent. Plus, up to 250x zoom is possible when Dynamic Fine Zoom is enabled, although as this is digital zoom we wouldn't recommend using it. The aperture range is pretty bright, ranging from f/2.8-8, and the camera features a 16mp BSI CMOS sensor. The camera has an upgraded EXPEED image-processing engine and the Dual Detect Optical VR will help with camera shake, giving a vibration reduction equivalent to a 5.0-stop increase in shutter speed which should aid with hand-help shooting even when using the full telephoto reach of the camera. Nikon says they have used 'Super ED and ED lens elements' in the construction of the lens, too, which helps with the reduction of chromatic aberrations and the autofocus system lets you shoot continuously at 7fps. As for creative options, there are 7 'picture controls' (Standard, Neutral, Flat, Landscape, Portrait, Vivid and Monochrome). You can also customise the controls and use the Picture Control system to sharpen, adjust clarity or add/remove contrast. The time-lapse mode is also available which, with the full length of the zoom you can use to capture a sequence of the moon travelling through the sky or even of star trails. Talking of the moon, there's a Moon mode which optimises camera settings to capture better astronomical images and with Bulb or the Time Shooting modes, you can capture night shots with ease. If you're a Multiple Exposure fan, you can overlay up to three shots to create unique images, too. For bird photographers, there's a Bird-watching mode so you can capture photos of shy, fast-moving subjects with all of the settings you need to get clear shots. 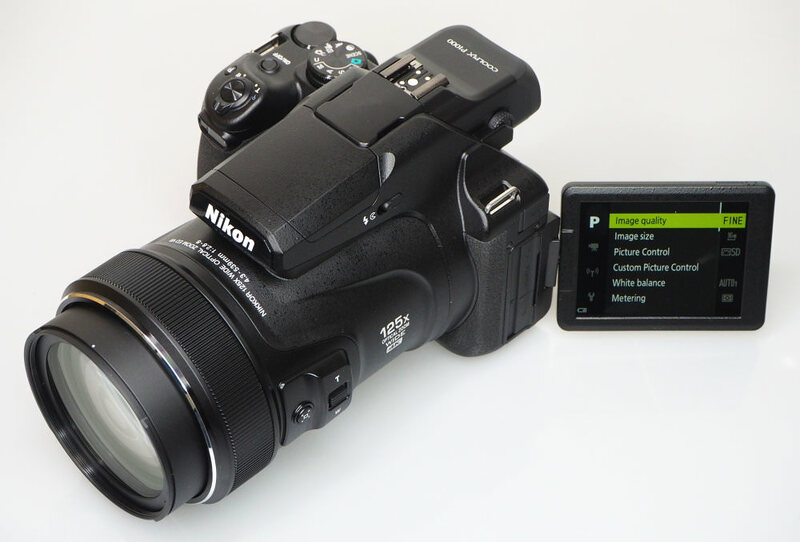 The Nikon Coolpix P1000 records 4K UHD video at 30fps, and the full 125x optical zoom can be used while shooting video! The Coolpix P1000 supports the recording of high-definition 4K UHD/30p movies - an improvement over the P900 which only captured video in Full HD resolution. The full zoom of the lens can be used when shooting video and frames from movies recorded in 4K UHD format can also be saved as still images. When you first look at the Nikon Coolpix P1000, your first words will probably be: 'It's massive!' and there's no hiding the fact that it is rather enormous and weighs quite a bit. In fact, after holding the camera up to the sky to try and capture some shots of passing planes, my arms did start to feel quite tired. Bulkiness aside, the large rubberised grip gives a stable hold and the side zoom control means you can extend the zoom quite easily with just your thumb. There's also a 'snap-back' zoom button which you just have to press to retract the lens which is designed to help you find your subject quickly if you've lost it, it also means you're not holding down the zoom button waiting for it to come back from the huge telephoto end to wide. 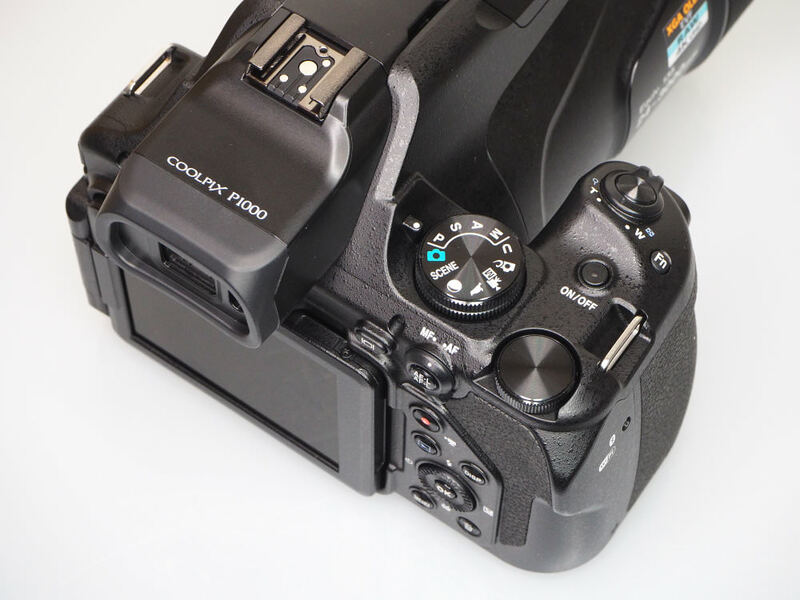 On the back is another large thumb grip and there's also one on the left-hand-side to aid with grip but we really wouldn't recommend you use the Coolpix P1000 with just one hand. The buttons on the back are kept to a minimum with only the ones you should need instant access to, the rest of the options can be found in the menu system. You can set the exposure compensation, focus mode, self-timer and flash options with the scroll wheel on the back, or customise the Function (fn) button to give access to another option such as the ISO setting, or drive mode. Unlike a lot of other cameras, there is no "Quick menu" or quick access to menu settings, you either use the provided function buttons, or go in to the menus to change settings. Surrounding the lens is a lens ring, which on default settings is used to adjust the exposure compensation. This can be customised, so that you can choose what this sets with the options being exposure, ISO, white balance or off. You can also customise the left hand side zoom control to act as either a zoom control, or manual focus. 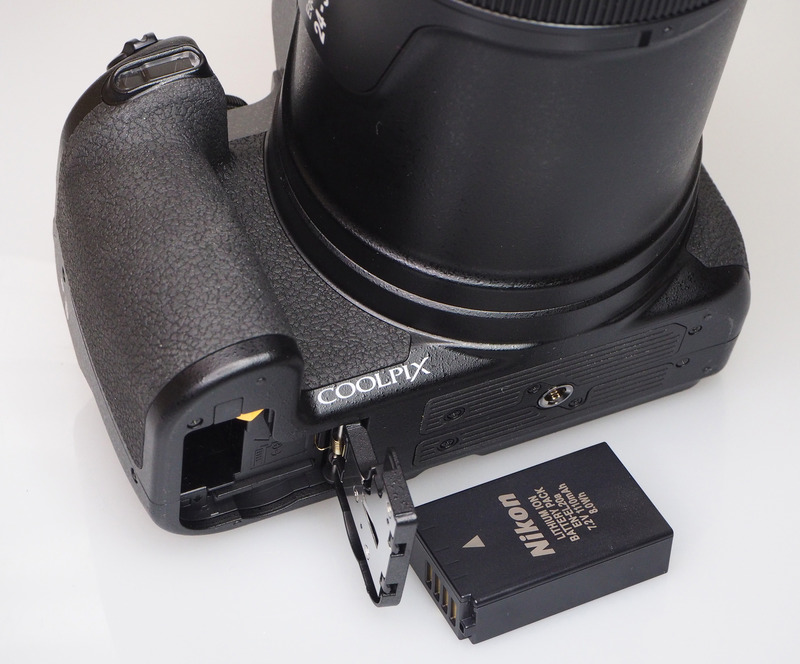 The front of the lens has a 77mm filter thread, which makes it possible to attach filters. The front of the lens has a 77mm filter thread, which makes it possible to attach filters and it also comes with a lens hood which, again, improves on the P900 as there wasn't one available for this camera when it was first released. The electronic viewfinder (EVF) is a decent size, features a high-resolution of 2.36m dots, a dioptre adjustment dial and the view is large. An eye sensor automatically switches from monitor shooting to viewfinder shooting the instant you raise the camera to your face, too, and the eyecup is comfortable although not as soft as the ones you find on DSLRs. The Nikon menus are clearly laid out and include a shooting menu, movie options, Wi-Fi options, Location data options and Setup options. The screen is not a touch-screen, however, it does have good viewing angles and shows a good resolution with clear results. It's also a vari-angle monitor so you can shoot in more awkward situations (low down etc.) more easily, as well as tilt the screen forwards so that you can see yourself. Wi-Fi features - Built-in Wi-Fi lets you connect the camera to your smartphone so you can transfer movies shot with the P1000 and Bluetooth means you can sync photos to your smart devices without having to connect the devices together each time. Bluetooth is also Low Energy so it won't drain the battery quickly. You do all this via the Nikon SnapBridge app, available for iOS and Android. Battery life - Even though battery life is quoted at 250 shots, we were often left worrying about how much battery life was actually left and it really lets the performance of the camera down. Carrying a spare Lithium-ion EN-EL20a battery is recommended. When the camera is mounted on a sturdy tripod shouldn't all the inbuilt vibration reducing gizmos be turned off. The videos I've seen, at full zoom, are often poor simply because of atmospheric perturbations. Looking at the rings of Saturn through a really good astronomical telescope would suffer similar problems. I watched a Polish photographer last night on YouTube film an old fisherman 1 mile away across a lake and you could actually read the writing on his carrier bag! Blowed if I can see why anyone would want a 125x zoom bridge camera. Another camera designed by the 'big numbers sell' marketing department...:( OK at sensible subject distances, [b][i]not [/i][/b]a Transit van halfway across the city, the 3000mm possibly does a better job and the 2000mm setting may be quite useable but at 1400g + it's not exactly a camera for every day, take it on the off chance, use is it. Frankly I can think of more interesting and fun ways to blow a grand - on beer for a start. PS Actually one thought that struck me reading the review and looking at the pictures of the camera: considering how necessary a tripod appears to be and how much the lens extends out I would suggest that the tripod fixing is too far back and would be far more effectively situated at least halfway along the lens housing - possibly further. Another camera designed by the 'big numbers sell' marketing department... OK at sensible subject distances, not a Transit van halfway across the city, the 3000mm possibly does a better job and the 2000mm setting may be quite useable but at 1400g + it's not exactly a camera for every day, take it on the off chance, use is it. Frankly I can think of more interesting and fun ways to blow a grand - on beer for a start. Actually one thought that struck me reading the review and looking at the pictures of the camera: considering how necessary a tripod appears to be and how much the lens extends out I would suggest that the tripod fixing is too far back and would be far more effectively situated at least halfway along the lens housing - possibly further. [quote]When the camera is mounted on a sturdy tripod shouldn't all the inbuilt vibration reducing gizmos be turned off. The videos I've seen, at full zoom, are often poor simply because of atmospheric perturbations. Looking at the rings of Saturn through a really good astronomical telescope would suffer similar problems. I watched a Polish photographer last night on YouTube film an old fisherman 1 mile away across a lake and you could actually read the writing on his carrier bag! It does look an amazing camera and from the photos I've seen, it looks to be the business;) I'm off to the gym now, to beef up my puny muscles ... so I can lift it up to my eye:([/quote] On VR it would have helped if the test had commented on the efficiency of VR at different focal lengths - this tends to be a challenge with IBIS. Nikon (and Canon) have a wide range of lenses with tripod mode VR/IS :D The camera being able to read lettering on a camera bag at 1 mile is a testament to lens quality, though advanced photographers appreciate the challenges of getting good detail at that distance. I agree the camera seems able to "do the business" - and the price point is not aimed at beginners. Can you lift something as "heavy" as a Nikon D7200 with an 18-200 VR attached? With the lens retracted the P1000 is shorter and lighter. Quote:When the camera is mounted on a sturdy tripod shouldn't all the inbuilt vibration reducing gizmos be turned off. On VR it would have helped if the test had commented on the efficiency of VR at different focal lengths - this tends to be a challenge with IBIS. The camera being able to read lettering on a camera bag at 1 mile is a testament to lens quality, though advanced photographers appreciate the challenges of getting good detail at that distance. I agree the camera seems able to "do the business" - and the price point is not aimed at beginners. Can you lift something as "heavy" as a Nikon D7200 with an 18-200 VR attached? With the lens retracted the P1000 is shorter and lighter. [quote]Blowed if I can see why anyone would want a 125x zoom bridge camera. :(:$[/quote] RLF Plus is not! The camera is not priced to appeal to a beginner. It can be regarded by some as the ideal "do it all camera" with a price to match including so many features. Less than 15% of cameras used are interchangeable lens type. 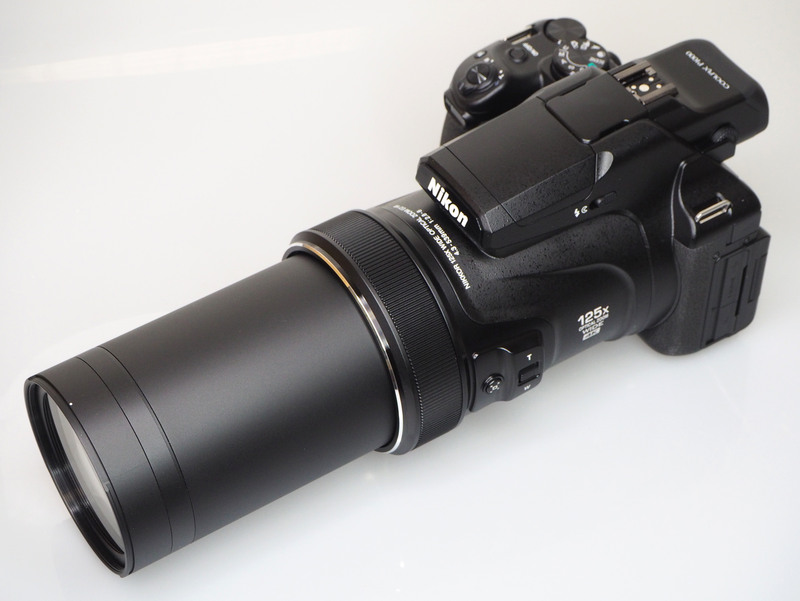 An interchangeable lens camera even 4:3 would need to be significantly more massive to get to 3000mm equivalent. Buyers [i]may[/i] fall into 2 categories, being on the one hand those who never learn how to get images out of the camera and those who have the ability to get the best out of a reasonably compact camera for the zoom range. Quote:Blowed if I can see why anyone would want a 125x zoom bridge camera. The camera is not priced to appeal to a beginner. It can be regarded by some as the ideal "do it all camera" with a price to match including so many features. Less than 15% of cameras used are interchangeable lens type. An interchangeable lens camera even 4:3 would need to be significantly more massive to get to 3000mm equivalent. Buyers may fall into 2 categories, being on the one hand those who never learn how to get images out of the camera and those who have the ability to get the best out of a reasonably compact camera for the zoom range. [quote]Another camera designed by the 'big numbers sell' marketing department...:( OK at sensible subject distances, [b][i]not [/i][/b]a Transit van halfway across the city, the 3000mm possibly does a better job and the 2000mm setting may be quite useable but at 1400g + it's not exactly a camera for every day, take it on the off chance, use is it. [/quote] For the zoom range it is quite light and compact. Quote:Another camera designed by the 'big numbers sell' marketing department... OK at sensible subject distances, not a Transit van halfway across the city, the 3000mm possibly does a better job and the 2000mm setting may be quite useable but at 1400g + it's not exactly a camera for every day, take it on the off chance, use is it. For the zoom range it is quite light and compact. Next time I want to photograph the writing on a camera bag at a distance of one mile I shall consider this camera. Quote:Next time I want to photograph the writing on a camera bag at a distance of one mile I shall consider this camera. There is no realistic point buying anything if you do not have a use for it. My nearest Nikon retailers first supply arrived yesterday morning. By the time I got there at 3.30 there were none left to see.